Home/When Roto speaks – they all listen! Bill ‘Roto’ Reuter is a one-of-a-kind motivator, and his ability to offer a wide variety of inspirational messages with humor, humility and charm is unmatched, making his presentations both memorable and entertaining. His many years in the cockpit of a Naval Strike-Fighter, his honor of family and faith, his wit and varied leadership experiences, mix well with his powerful command presence to yield a high-velocity learning experience. It’s one that will leave you wanting more. Bill “Roto” Reuter is one of three boys and grew up in a small Key West community. His lifelong dream was to become an astronaut. Although he gave it his best shot, his “dream” of becoming an astronaut never came to fruition. However, in the process of trying to reach it, he became a successful and respected Navy pilot and officer. One of his more demanding positions was as a test pilot, where his focus and that of his team’s was ensuring the safety for our nation’s pilots who would eventually use the same equipment after it was fielded. For Roto, these were the times he developed his clarity of purpose. He tested and qualified equipment and safety measures – some that might have saved not one, but two of his lost fellow Navy pilot friends had they been in place. It was in that environment — stressful but exhilarating, fulfilling and sometimes tragic — Roto began to develop his own understanding of what motivates people, how one builds trust and why groups achieve success. 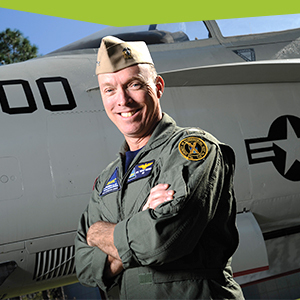 As a natural progression, Roto went from test pilot to commander for the Navy’s premier training system research and development organization, managing more than $1 billion in training solutions annually, and leading a diverse team of more than 1200 Navy professionals, both active duty and civilians. Roto’s commitment to service, his love for country, and his deep respect and care for humanity are evident in his zeal for life. His passion is to help people and organizations identify their challenges and implement plans for improving processes and organizations, and to help inspire leaders and encourage personal growth.